No longer will flexible workspace be the exclusive domain of entrepreneurs and small business owners, as corporate businesses are seeing the benefits of flex space for their satellite and branch offices. As an alternative to traditional satellite and branch offices, flexible workspace is a tailor-made solution that may prove to be a disruptive, long-term trend in this segment of the office space market. In this article, Telsec’s marketing and community manager discusses why there is far more driving the move to a flexible workspace by corporations than merely low-cost office space. As a business owner, you’re likely familiar with the cost of turnover for hourly employees, factoring in the investment in interviewing, screening, onboarding, and training. Add to that the lost productivity and engagement of dissatisfied employees: in a survey of 1,200 hourly workers by FSG and Hart Research Associates, the majority of respondents indicated they wanted to leave their current positions within less than a year. Here the author offers seven tips to help reduce the turnover of hourly workers for your business, from implementing a well-structured onboarding process to providing a clear path to progression and promotion. For this year’s renowned tech conference Web Summit, the City of Toronto assembled a Canadian delegation to promote it as the home of the first Collision conference (Web Summit’s “North American sister event”) this upcoming May. 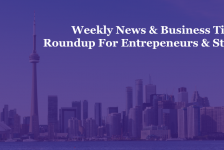 The article discusses key takeaways from the global Web Summit, including “the world’s perception of Canada,” as well as video clips and summaries of “outstanding keynotes,” such as the future of venture capital. “If your computer is cluttered with disorganized files and unnecessary apps, it’s tough to get any work done,” the author says. If you’re challenged to organize your computer desktop in “a meaningful, intuitive way,” he suggests starting with acknowledging the main obstacles that get in the way (choosing a standard, clearing the clutter, finding the time, and the big one – staying consistent). Then he discusses seven strategies for getting (and staying) organized, from consolidating your most important apps to scheduling a recurring cleaning session. Distinguishing between an innovative business idea and the right idea for your business, the author details a five-step process to finding an innovative business idea that you can use to hone in on the right one for your business-to-be. Beginning with finding “the sweet spot” where what you’re passionate about, what you’re good at, and what people are willing to pay for overlap, he then delves into steps two through five: generating business ideas; prioritizing and choosing the idea with the most potential; creating hypotheses for obstacles and your key assumptions; and finally, validating the core assumptions of your theory. As one of the ‘isms’ like sexism and racism, ageism is discrimination against those 50 and older. The author sums the many forms of workplace ageism as “being refused employment, dismissed, made redundant, or denied a promotion simply because you are considered too old for the job.” And while it is illegal to discriminate against someone due to their age, she continues, “ageism is unfortunately one of the ‘isms’ that is alive and well and actually on the increase, due to our aging population and the need for many people to continue working past retirement age.” She then delves into how to identify ageism in your business, why it is bad for business, and how to combat ageism in your workplace. The author prefaces this article with how he felt old as younger entrepreneurs asked him how he succeeded “back in the day,” but now embraces it. He states that “some young entrepreneurs haven’t liked my answers to their three favorite tactics,” as they are actually distractions that can prove fatal: growing your first business too fast; obsessing about a personal brand; and lastly, excessive networking. Who gets more done – office workers or telecommuters? Removing the stress of a commute, the fact that office workers “stand at the water cooler chatting for an hour,” and studies showing that creative tasks are “better completed away from the cubicle” while “dull tasks” such as data entry are more suited for office work, are among the factors that support telecommuting as a way to retain top talent. “Entrepreneurs are not known for having work-life balance. In my experience, trying to find balance as a startup founder is like looking for a real-life unicorn” says the author and CEO of LegalZoom. If you’re looking to create something that is disrupting an industry, the path isn’t going to be easy.” His advice to entrepreneurs on achieving balance? First, grow the company. “Second, and most importantly, look for a co-partner that is just as strong as you are.” He then delves into how to go about finding a co-partner who excels in areas where you don’t, freeing you up to focus on tasks where you can leverage your strengths.